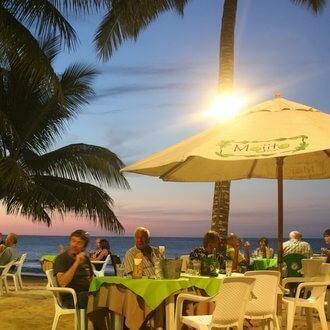 Cabarete has GREAT food and LEGENDARY nightlife. Eating well while learning to kiteboard (or improving your wave riding or foilboarding) is important. When you vacation, spend a season, work remotely, or even move full time to Cabarete you'll find a ton of good options to feed your body with healthy and delicious real food. And for your contented soul: sunset happy hours, Thursday night Latin dance parties, Monday karaoke, and every night nice people ready to share laughs and a dance. Cabarete Coffee Company, is a social business run by The Mariposa DR Foundation. Stop in their cute shop just 750m down the street (near Cabarete Beach Houses.) Or check out their menu online and call them for free delivery of breakfast or lunch right to your condo! Supporting this business helps our community end generational poverty, you'll feel great after a delicious breakfast or lunch (try the Kite Loop Panini). Aqua Restaurant at Millennium is right next door to LEK - we're so lucky to have a great restaurant RIGHT HERE! Run by detail and service oriented Israelis, and open breakfast, lunch and dinner you'll enjoy delicious pizza, salads and sandwiches, and what a view! The restaurant and bar moved in 2016, it's now located up above the old location, looking over the infinity swimming pool, the beautiful Cabarete Bay, and our little kiteboarding school in paradise. No trip to Cabarete would be complete without trying the national dish: La Bandera. Rice, pinto beans in a soupy sauce and chicken - fried or "guisado." Ask the LEK team for their best recommendations on where to find good, cheap local cuisine. The gear room guys (John Robert, Maxon and Amaurys) get lunch each day, you can ask them to buy you a plate and they'll bring it to LEK! Make sure to eat at Tropicoco, next to LEK on the road, for Saturday night BBQ, all you can eat and fantastic live Dominican music. During the winter months the Thursday night Thai buffet is also highly recommended. 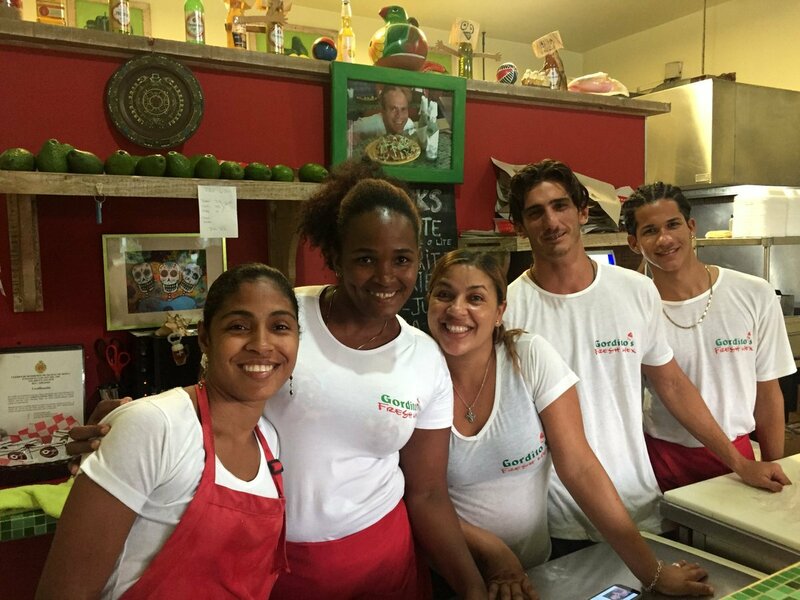 Great friendly service and fun tropical atmosphere. Lax Ojo is the place to start drinking with a sunset Happy Hour or a Power Hour Pitcher. What a great way to start an awesome night in Cabarete on the beach with chill vibes, a gorgeous view, sand in your toes and good music playing. When you're ready to move on just wander down the strip, all the nightlife is on the beach in Cabarete. Blue Moon is more than just dinner, it is a celebration of life well lived! Drive 25 minutes from Cabarete, winding your way up the palm tree covered mountainside and you'll be rewarded with an evening to remember! Sunset with a "Blue Moon Special - rum & passion fruit? Yes Please! Ask the LEK team to organize a trip during your kiteboarding visit to Cabarete, you need a minimum of 8 people for dinner at Blue Moon. Plaza Ocean Dream also has world class (in Laurel's world) sushi! Not to mention super friendly service. 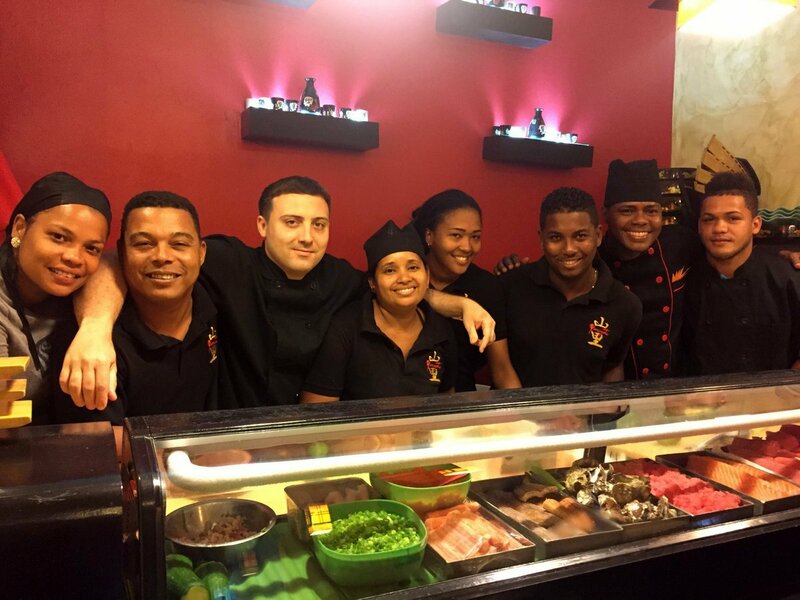 Yamazato Sushi is a MUST on your visit to Cabarete. A favorite with the LEK instructors is the beach front Mojito Bar, 10 minutes walk into the heart of Cabarete. Delicious cocktails, coffees, fresh juices, appetizers and sandwiches for the lowest prices at the beach. Getting tired of eating out? Or just love to cook? LEK's accommodation options all come with a full kitchen. Enjoy breakfast at home - yummy groceries readily available include free range eggs, fresh gourmet bread, luscious tropical fruits, locally made yogurt, and of course Dominican coffee!